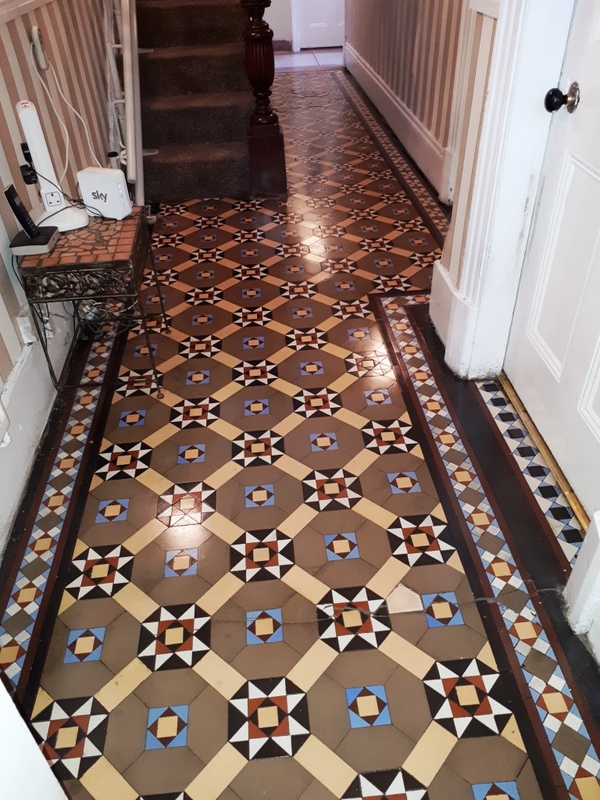 It may sound impossible to restore tiles that are over a century old back to something resembling their original condition but in fact it’s something we do all the time. With the right cleaning products and techniques, fantastic results can be achieved. An example being this work I did for a customer in Dudley. 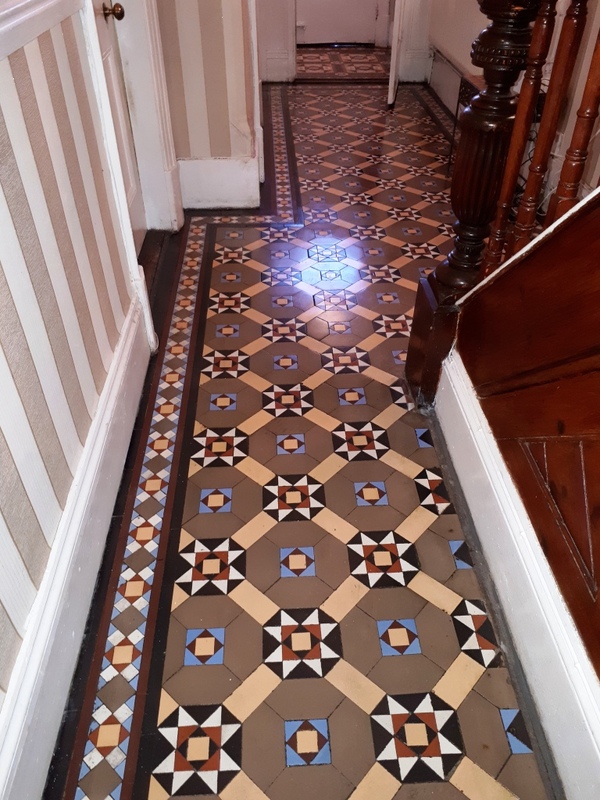 They had seen previous examples of Tile Doctor’s work and wanted to have their 128-year old Victorian tiled hallway which had been covered in carpet previous restored to its best possible condition. Dudley is a town in the West Midlands that is often touted as one of the birthplaces of the Industrial Revolution so there are lot of period houses. 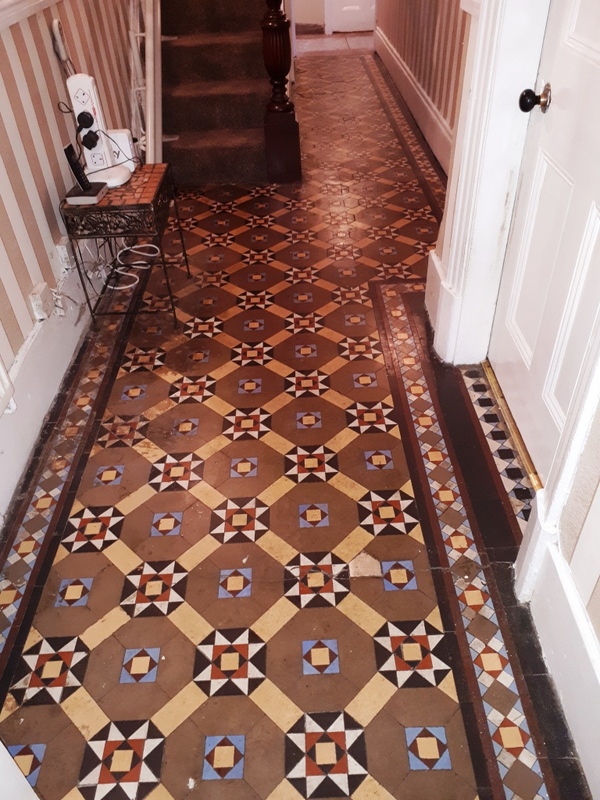 When I first went over to survey the floor I could see that restoring these Victorian tiles would be a significant job involving deep cleaning, tile repair and sealing. Upon closer inspection of the tiles, I realised that there was also a small area that met the hallway which was actually Terrazzo. This was to be cleaned and sealed too however I’ll deal with that in a separate post as the process was different. While the Pro-Clean was soaking into the tile, I carefully scraped off the paint that had been dropped on the tiles during decorating at some point in the past. 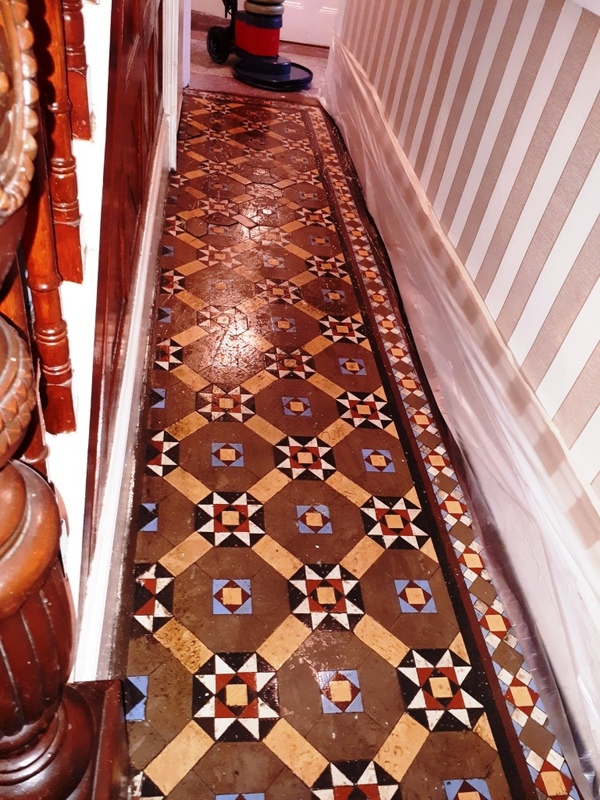 Next, I fitted a rotary machine with a 200-grit diamond encrusted burnishing pad – which is very coarse – and put it into action to remove deeply ingrained dirt from the tiles. When this process was complete, the floor was thoroughly rinsed with water and the resulting slurry was soaked up with the aid of a wet vacuum. 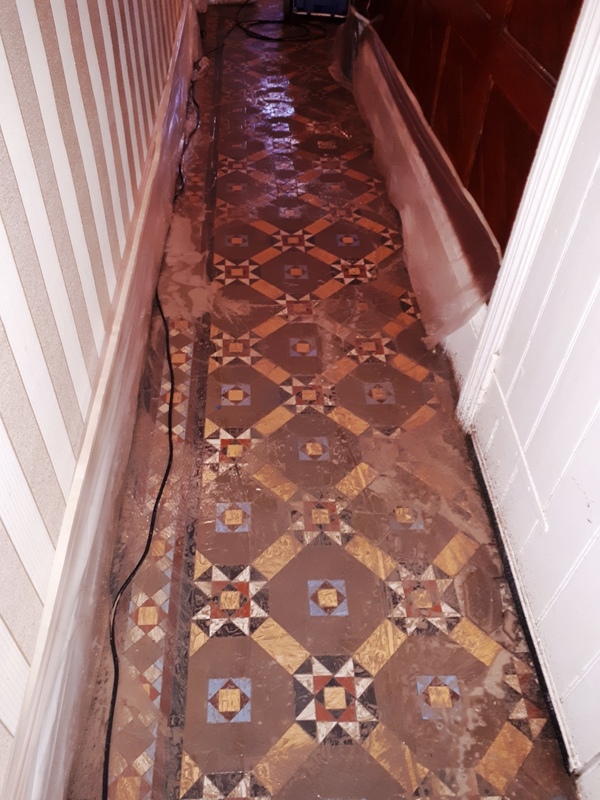 I repeated this process around the edges of the hallway, where the tiles were particularly badly ingrained with dirt and marked with carpet glue deposits. The floor was given a final rinse with water and the wet vacuum used again to remove as much moisture from the floor as possible before leaving it to dry off overnight. Before leaving however I had to complete the tiler repairs which involved removing the loose tile and mortar and then setting them back into place. There was also quite a lot of re-grouting that needed to be done on various areas of the floor. The next day, I returned to the property and ran damp tests in various places to ensure the tiles had dried. 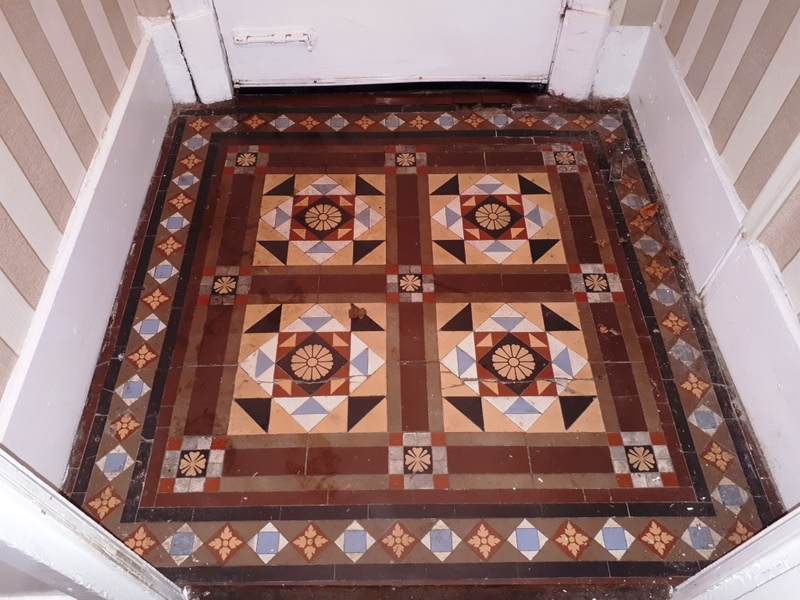 Given that these tiles are particularly old, I was conscious that that the floor very likely lacked a damp proof membrane and so damp issues could be a real possibility. We always ensure that floors are completely dry before sealing them as excess moisture can damage the performance of the sealer. 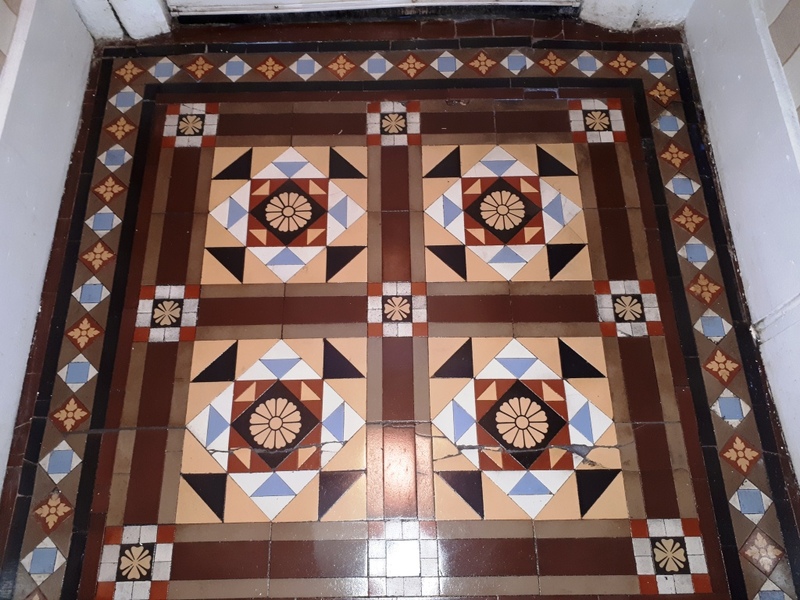 Thankfully, the tiles had dried out and, so I was able to start sealing them with four coats of Tile Doctor Seal & Go which added a nice sheen finish and will protect the floor going forward. Before leaving I left the customer with a bottle of Neutral pH tile cleaner to help maintain the tiles appearance. 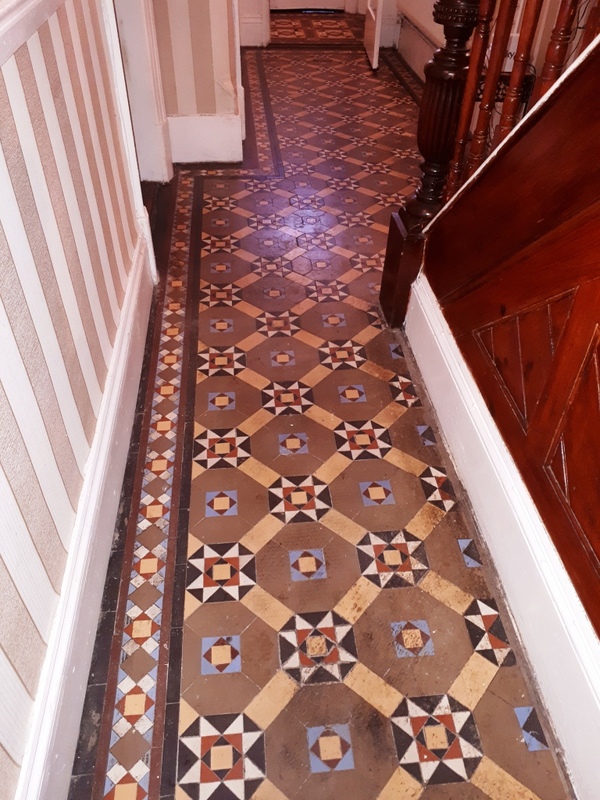 The customer was very happy with the results and commented that all the hard work had paid off to leave the floors looking great!